Sterling Children's Books, 9781454914044, 40pp. The race is ON Who will win the tastiest food fight ever? 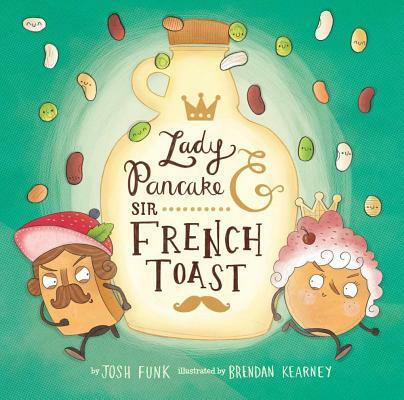 A thoroughly delicious picture book about the funniest "food fight" ever Lady Pancake and Sir French Toast have a beautiful friendship--until they discover that there's ONLY ONE DROP of maple syrup left. Off they go, racing past the Orange Juice Fountain, skiing through Sauerkraut Peak, and reeling down the linguini. But who will enjoy the sweet taste of victory? And could working together be better than tearing each other apart? The action-packed rhyme makes for an adrenaline-filled breakfast . . . even without a drop of coffee. Josh Funk lives outside Boston with his family. He has a system for eating pancakes so the bottom pancake gets the same amount of syrup as the top. Josh also has two other picture books coming out in 2016: Dear Dragon (Viking/Penguin) and Pirasaurs! (Scholastic). Whilst studying architecture at university, Brendan Kearney realized he didn't like rulers. He then discovered that it wasn't essential to use a ruler when illustrating children's books, and so traded architecture for illustration as quickly as he could. Having now completed his degree, he specializes in children's books, bringing his own chaotic style and ideas to any project. If you can't find him drawing you are likely to find him with a guitar or banjo in hand. Brendan currently lives in the UK.